If you think being on a low carb diet means you’d never eat shepherd’s pie again, you couldn’t be more wrong! I can’t lie. I love potatoes. I love them in any form – baked plain, topped with sour cream & bacon, as french fries, in stir-fries, mashed, anything. But when carb counting, you can’t eat all the potatoes you want. Luckily there’s something else for us fatties: cauliflower. Cauliflower is one of the most versatile vegetables. If you think it can only be used for boring stir-fries, you need to give this a try. 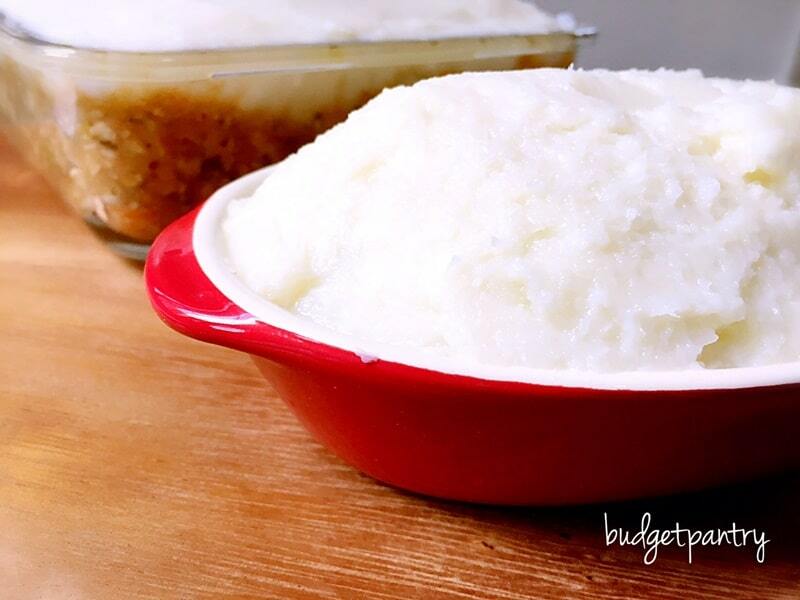 Mashed cauliflower in place of creamy mashed potatoes for shepherd’s pie? Yes it is possible! 100g of cauliflower = 5g carbs as compared to 100g potatoes which has 18g. That’s almost four times as much carbs which can be spent on something else! To make the cauliflower mash, all you need is a boiling pot of water and a food processor or hand blender. Boil cauliflower till fork-tender, drain, then mash till smooth and creamy. I love cauliflower as it is, but I find it great with some cream cheese mixed in. Some people like to add butter but I’m not a fan. Just a sprinkle of salt and some cream cheese is all I want in my mashed cauliflower. For the filling, I used minced chicken but you can use beef or lamb. One ingredient you shouldn’t miss out is Worcestershire sauce. It makes a huge difference to taste which makes you come back for more. And that’s ok, it’s low-carb! And finally, top with some grated mozzarella cheese and pop it into the oven or airfryer. 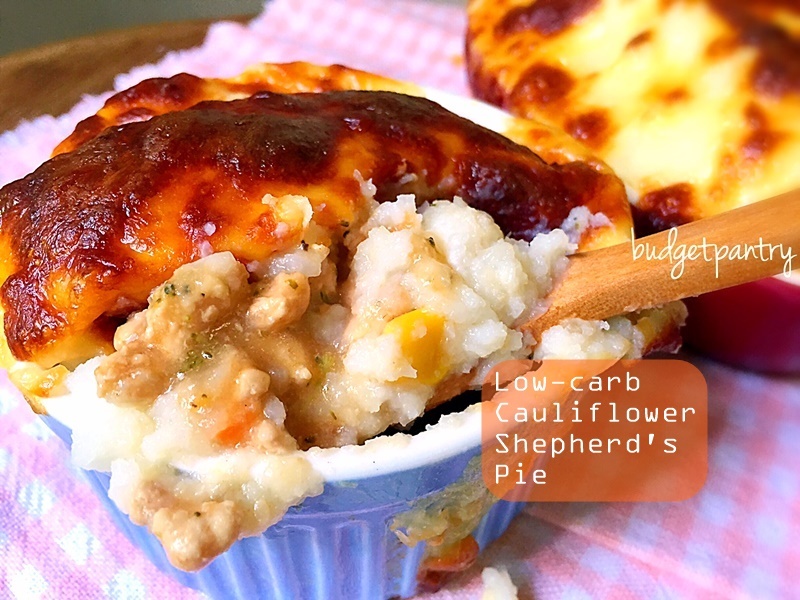 Enjoy your low carb shepherd’s pie! Preheat oven to 200C. If using a baking dish or smaller casserole (in batches), you can do this in the airfryer. Marinate the minced meat with light soy sauce and black pepper. Set aside. Cook the cauliflower in boiling water until tender, about 20-25 minutes. While waiting, prepare the chicken filling (see next step). When cauliflower is done, place in a food processor (or use a hand blender) to puree till it resembles mashed potatoes. Add the cream cheese or Parmesan cheese along with sprinkle of salt to taste. 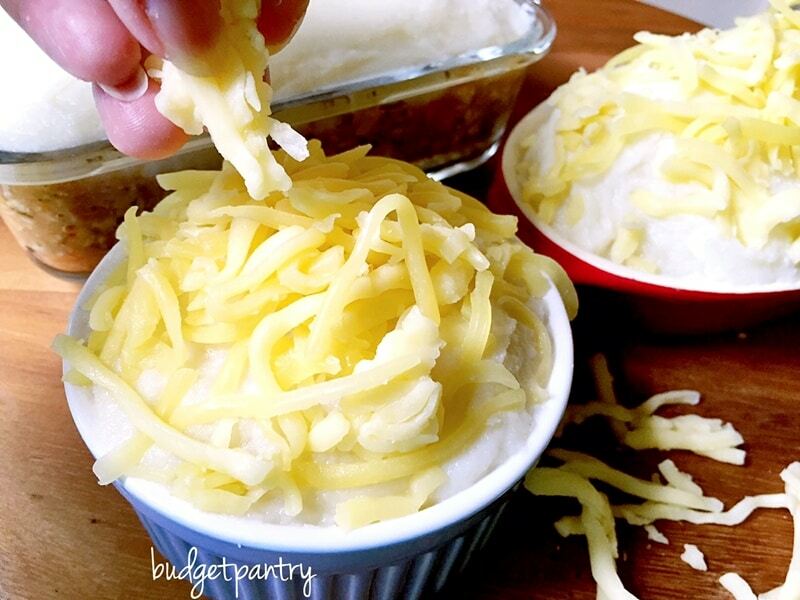 (I’m not a fan of butter in mashed potatoes, but if you are, you may add in some). Set aside. In a frying pan, heat up the oil and fry onions and garlic till fragrant. Add frozen vegetables and minced chicken and loosen with a spatula. Fry till no longer pink and add the Worcestershire sauce, tomato ketchup and chicken stock. Add the bay leaves and simmer for 20 minutes. Sprinkle plain flour loosely on top of the chicken mixture and stir in to combine till thick, making sure there are no lumps. 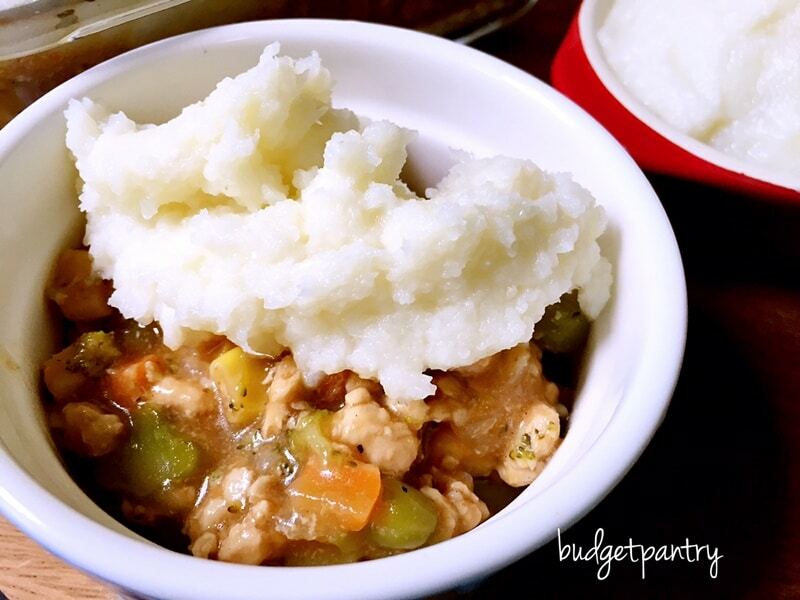 Assemble: Scoop chicken into casserole and top with cauliflower mash. Even out the top then top with mozzarella cheese. Bake for 15-20 minutes till cheese has melted.